James Till, professor emeritus in the department of medical biophysics, is the inaugural recipient of the Edogawa-Niche Prize. The international award recognizes a physician or scientist based on their contributions to interdisciplinary research leading to health-care solutions in disease prevention, diagnosis or treatment. Till will be officially honoured in Tokyo, Japan this weekend at the 2018 Nichi-In Centre for Regenerative Medicine (NCRM) NICHE International Stem Cells and Regenerative Medicine meeting. Till and his collaborator, Professor Emeritus Ernest McCulloch, were first to find evidence of clone cells, which at the time they referred to as ‘lumps,’ in the spleens of mice. They published their findings in Radiation Research in 1961. In 1963, the pair followed up with publications in Nature and the Journal of Cellular and Comparative Physiology, which established that the lumps were in fact multilineage stem cells capable of self-renewal and becoming specialized cells. Born in Lloydminster, Sask., Till received a bachelor's degree at the University of Saskatchewan, where he also completed a master's degree in physics in 1954. After finishing his PhD in biophysics at Yale University in 1957, Till was recruited to the Ontario Cancer Institute at Princess Margaret Hospital as a U of T postdoctoral researcher, where he began working with McCulloch. “Arthur Ham, who was head of the biological division at the Ontario Cancer Institute where Ernest and I were research recruits, encouraged us to get to know each other. Ernest made a great presentation to the group, which prompted me to volunteer to help him when he wanted to use our irradiation facility. That’s how the inspiration for our work began,” recalled Till, who would collaborate with McCulloch for more than 20 years. Till and McCulloch’s work has had applications in the field of bone marrow transplantation, cancer treatment and the treatment of autoimmune disease and tolerance induction. He also helped blaze a trail for other groundbreaking scientists. 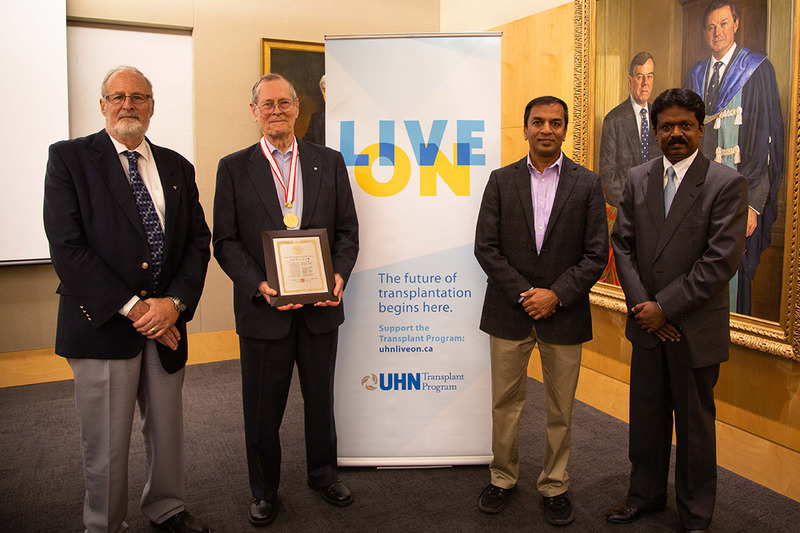 Levy, who is also the founding director of University of Toronto Transplant Institute and the CIHR Training Program in Regenerative Medicine, presented Till with a medal and plaque in Toronto last month. The award presentation will be videocast at the NCRM NICHE event on Sunday. Upon receiving the award, Till dedicated the honour to his collaborator, McCulloch, who passed away in 2011. “Ernest’s contributions to our team made our work possible. Without him, it wouldn’t have happened,” said Till. The prize is awarded by the NCRM, which is devoted to research, training and clinical applications-protocol development in regenerative medicine with a special emphasis on stem, progenitor and autologous adult cells with regenerative capability. The institute provides a platform for collaboration between scientists across various specialties. NCRM is an Indo-Japanese joint venture institute affiliated with Tamilnadu Dr. MGR Medical University and Acharya Nagarjuna University. In 2009, the institute entered a formal agreement for training students with the CIHR Training Program in Regenerative Medicine at U of T.
Till’s plaque and medal will be displayed at the Edogawa-Niche Hall of Fame, which is set to open in Tokyo next year. Till was also awarded one million Japanese yen (approximately $11,800), which he donated back to NCRM NICHE to establish the Joyce and James Till Travel Grant, which will support travel and other associated necessities for young scholars from developing countries to take part in future NCRM NICHE events.